Peter C. sent in these pics of his Rigby 12-bore double. History means a lot to me (as a former history teacher) and Peter also appreciates doubles with history. His Rigby was made for the Maharaja of Bulrampore, Sir Digbejai Singh, officially titled: Bahadur. Badadur is a title that means "The Warrior" or "The Brave". The K.C.S.I. is the Knighthood he was awarded for assisting the British during the Indian Mutiny. It stands for Knight Commander of the Star of India. 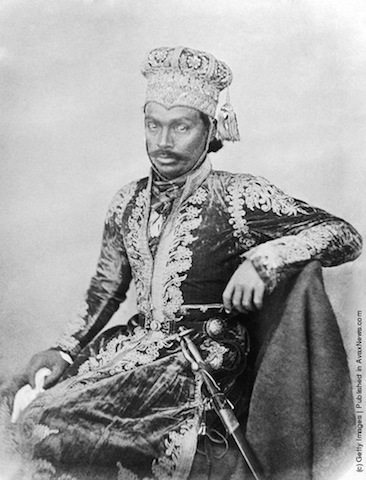 Bahadur K.C.S.I, 1868.